Because of his lovely green color and very small size, it is actually pretty easy to see why this gorgeous little bird is named a leafbird. 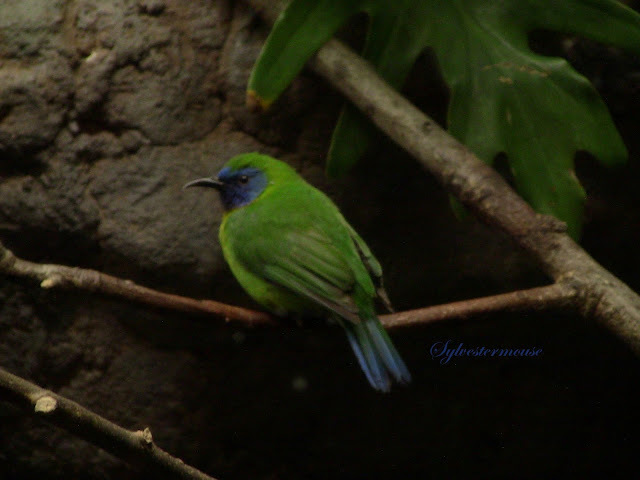 In the canopy of trees, the leafbird could go virtually unnoticed unless he moves or sings to attract attention. 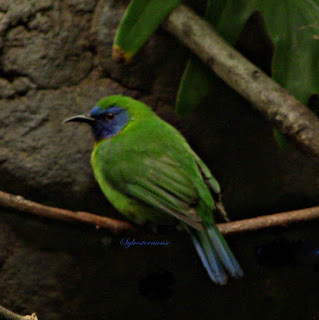 It is also clear to see why he is call a "blue-masked" leafbird. He does look like he is wearing a big blue mask on his face. The blue and yellowish colors of his feathers also help him to blend in with his colorful tropical surroundings on the island of Sumatra in western Indonesia. Like hummingbirds, the little Blue Masked Leafbird collects pollen while eating. Therefore, as he flies from one flower to the next, he cross-pollinates flowers while he is drinking the nectar from each flower. A great example of how animals and flowers help each other survive in nature. I do love songbirds, but I don't normally include videos on the Amazing Wild Animals site. However, I wanted you to be about to hear this little songbird for yourself. Close your eyes and listen! He will make you feel like you are resting under a canopy of trees, or walking through the Rainforest. There aren't many Blue Masked Leafbird products available, so I added my own photo to a mug on Zazzle. If you would like to have this photo on a different Zazzle item, please leave me a note in the guestbook below. I'll be happy to add it for you. What a beautiful bird with such a melodious song! Your picture looks great on a mug. That would put a smile on my face with my morning mug of tea! Thank you Susan! After I put the photo on the cup, I was thinking, I might just need that mug myself. Did you take that amazing picture of the beautiful wee bird? Amazing is an understatement and I'm glad you added the video he sounds really pretty too! Yes, I did indeed take that photo myself Grammie O. Thank you for the compliment on the photo, but it truly is the subject that makes an amazing picture. I'd never heard of this beautiful little bird before. Such a shame to see it in a cage. It ought to fly free. It looks very nice on the mug. I do agree with you about the cage. These gorgeous birds should be left in the wild whenever possible. I have to hope the owner made the choose to cage the bird in order to save the bird. What a gorgeous bird the blue masked leafbird is, mind you I do think that all birds are beautiful so I'm probably a little biased! A gorgeous photo Cynthia, I love taking photographs of birds they are often some of the best subjects. Thank you Louanne! I love birds too and I am always so thrilled when I actually get a good photo. Seems like they are constantly moving which makes them a bit harder to photograph. Gorgeous, gorgeous bird. 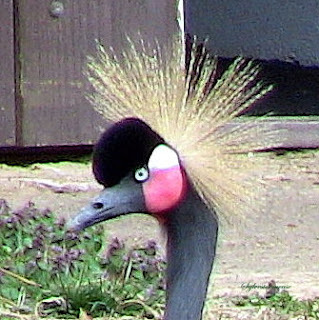 I thought I was fairly knowledgeable about birds but I've never seen this one. It's so pretty - thank you for sharing.